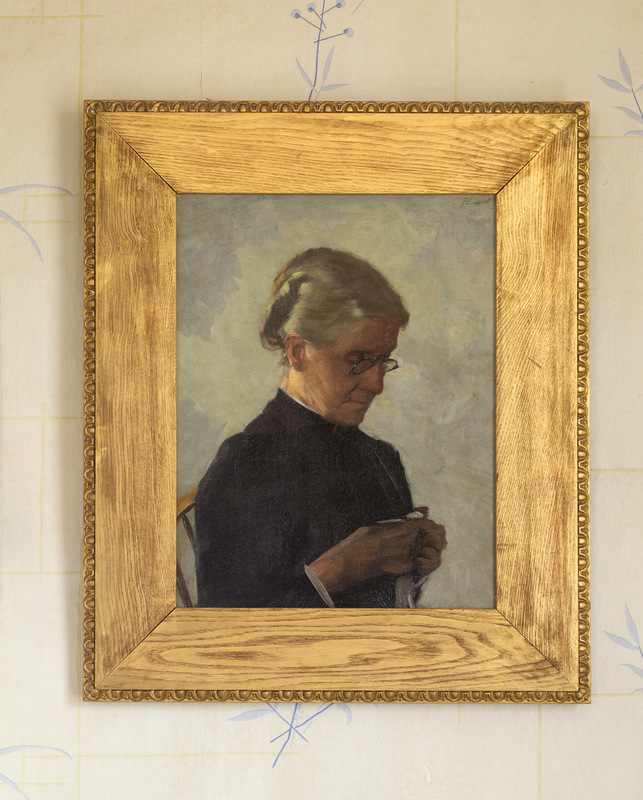 This intimate portrait of Mary Emerson Ripley Simmons was painted by her son Edward, who lived at The Old Manse as a young boy. Indeed, upstairs in the attic, “Eddy” penciled drawings of a bumble bee, catfish, bird and rodent on the pale yellow plaster walls, as well as leaving the whimsical phrase, “Here we sleep and dream.” Born in Concord and the son of Reverend George Simmons, a Unitarian minister and abolitionist, Edward would attend Harvard College and go on to study at art schools in Boston and Paris. Prolific in his work, some of Edward’s most lauded pieces include a stained glass commission with Louis Comfort Tiffany at Harvard University’s Memorial Hall and painted murals at the Chicago’s 1893 World’s Columbian Exposition, the Library of Congress, and the Massachusetts State House. The Old Manse (1770) in Concord, a National Historic Landmark, was the home of the Reverend William Emerson, a patriot minister who died as a chaplain in the Revolutionary War. He joined the Colonial militia after witnessing the battle of April 19, 1775 from his home adjacent to the battlefield and the North Bridge. After Emerson’s death, his wife, Phebe Bliss Emerson, married Rev. Ezra Ripley and retained ownership of the house. Emerson’s grandson, Ralph Waldo Emerson, drafted his essay “Nature” at the Manse, the publication that formed the foundation for the Transcendentalist movement. From 1842-1845, Nathaniel Hawthorne lived there and wrote Mosses from An Old Manse. Apart from Hawthorne’s rental time period, the Manse was owned and occupied by the Emerson and Ripley families until The Trustees purchased the property in 1939.